This is a plan of the Kentish flatlands surrounding Faversham, to the south of The Swale. Ruled red-ink lines radiating from observation stations and intersecting across the map, indicate angular measurements taken by the surveyor between fixed triangulation points. 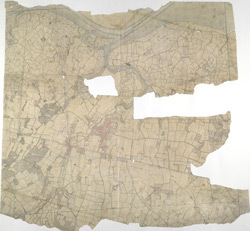 The irregularly shaped paper is so worn and torn that much of the detail is now erased.